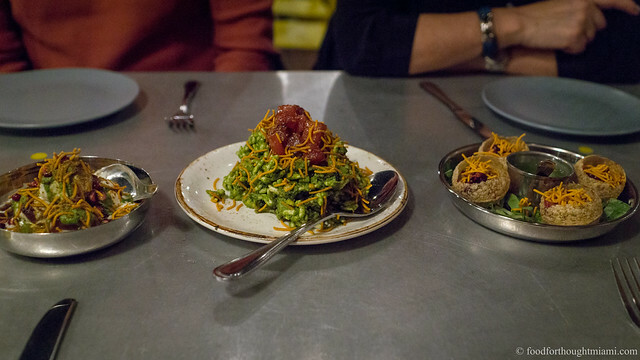 The last time I was at Cena by Michy (which would, alas, turn out to be the last time I would ever be at Cena, which closed a couple months later), Michelle Bernstein introduced me to her latest chef de cuisine, Mike Mayta. He – and his wife Keily Vazquez, who together also ran Illegal Bakery – were joining a distinguished group of alumni who have passed through Michy's kitchens and dining rooms: Timon Balloo, Lindsay Autry, Jason Schaan, Berenice de Araujo, coctkail master Julio Cabrera, wine savant Allegra Angelo. Cena is gone, but chefs Mayta and Vazquez have found another place to ply their trade, with a pop-up called Dusk, operating in the Crumb on Parchment space in the Design District (probably not coincidentally, also run by Chef Bernstein). They've put together a menu of a baker's dozen of dishes, some with Latin leanings (ajiaco pot pie, brisket saltado), others a bit more gastropub-y (chicken 'n' biscuit with chicken liver mousse, chorizo scotch egg), and some with a little bit of both (yuca fry poutine). We made our way through a good bit of that menu Saturday night, and enjoyed everything we tried. My favorite – very possibly influenced by its having been inspired by the Burger of the Day from Bob's Burgers – was the "Etouffee Brute." 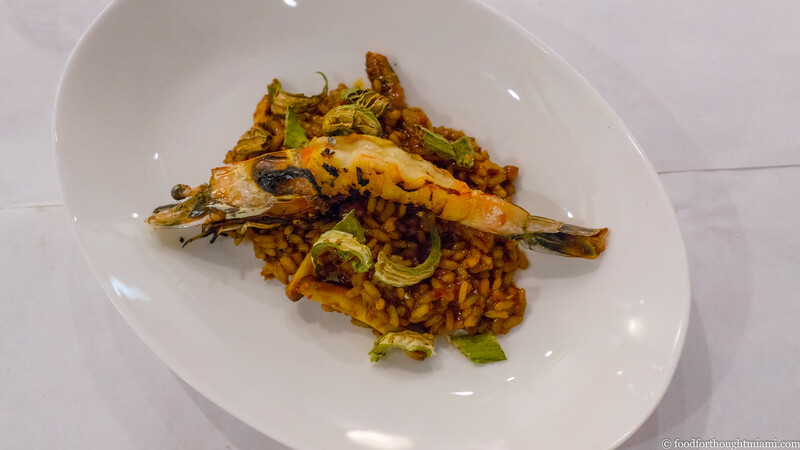 This Cajun-Italian hybrid combined risotto style carnaroli rice, bound and enriched by a ruddy seafood stew studded with strips of nubby octopus, bolstered and warmed with 'nduja sausage, flecked with slivers of dried okra, and crowned with a plump, juicy head-on royal red shrimp. 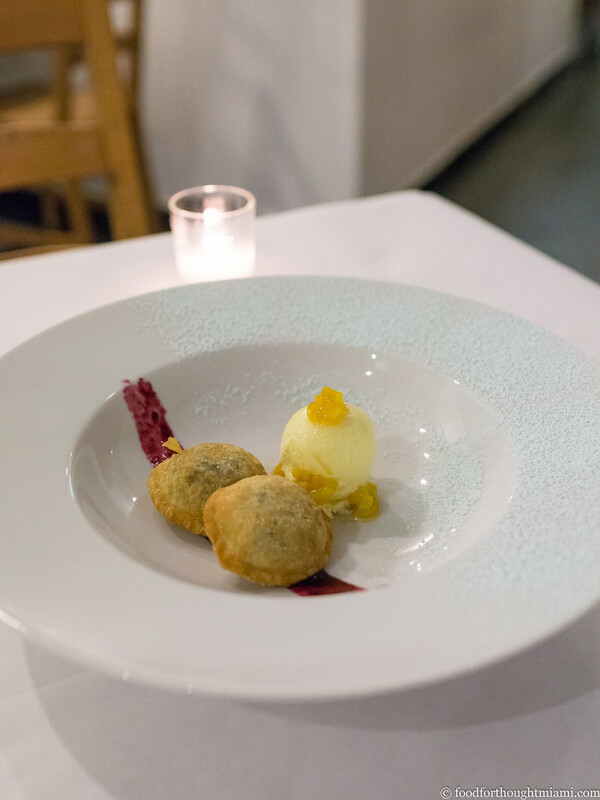 A strong runner-up was a summery dessert from Keily Vazquez which combined dainty little blueberry pies with a delicious sweet corn ice cream. You can see all the pictures from our dinner in this Dusk - Miami Design District flickr set. Dusk is operating Thursday-Saturday evenings in the Crumb space, from 6pm to 10:30pm, with plans to be there through September.